03feb10:00 am11:00 pmSouper Bowl of CaringOpportunities all month! Offering on Feb. 3rd! Souper Bowl of Caring 2019! Help the NEPC Student Ministry help those who are less fortunate. How? Souper Bowl of Caring 2019! Help the NEPC Student Ministry help those who are less fortunate. How? Donate food items during the month of January. Look for drop off locations in Kids Ministry, SM Auditorium, 803 Auditorium, the Atrium and the Nathex. Eat at the NEPC Soup Kitchen on Wednesday, January 30th for our Wednesday Night Dinner. 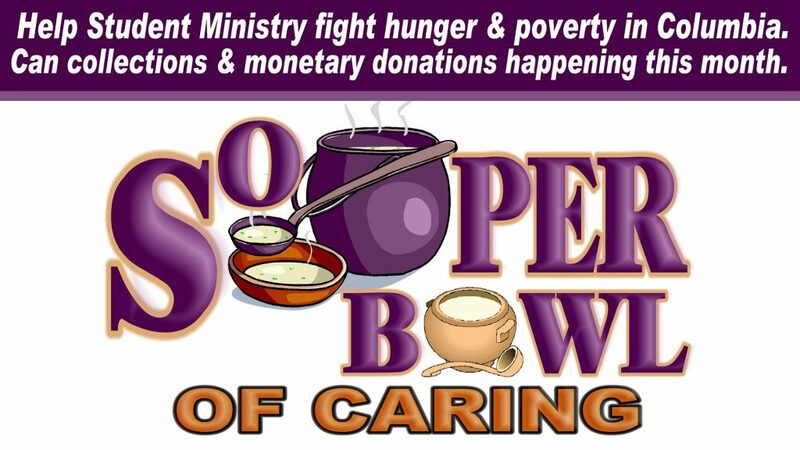 Donate during the Souper Bowl of Caring offering on Sunday, Feb. 3rd during both the 10:00 AM and 11:15 AM Worship Services. For more information, please visit the NEPC Student Ministries page or contact Caroline Reynolds at 803-760-4903 or Sammy Grace Henning at 803-240-4009.